When Kerry Collins scrambled (although to my eyes it was more of a lurch than a scramble) for a touchdown in last year’s slothful loss to the Dolphins, he elicited raised eyebrows and high praise. So low were the expectations for KFC that any improvisation from the pocket, no matter how unspectacular, was met with shock and awe. But if I’m looking for guts and determination, I will look elsewhere. 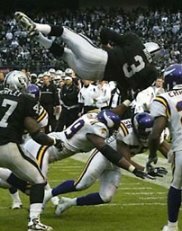 I will look back to November 16, 2003, when the lowly Rick Mirer—pressed into action due to a rash of QB injuries—was so driven to beat the Vikings that he gave up body and soul in pursuit of a touchdown. I had the good fortune to be in Row 5 of Section 127 on that day. I thought he might helicopter right into my seat. The Raider Nation erupted into an ear-splitting roar in appreciation of Mirer’s will to win in the twilight of a lost season. And win he did, joining a masterful defensive effort to help orchestrate one of the few bright spots in a largely dark season. Great post. On that note. I was at the superbowl in the nosebleeds and besides thinking that we were going to run away with the game when Chuck picked off Brad Johnson in the first quarter, the only thing I want to remember from that game was how awesome it is that Jerry Rice was on our team for a while. I remember with the game out of reach on our last posession Jerry trying and fighting to get out of bounds after Gannon hit him on a quick hitch. Here is a guy with NOTHING to prove, yet still tries 110% on every snap. I am proud he wore silver and black. Hopefully, whoever decides to lead this team takes his example.